I’ve received an amount of feedback recently and wanted to share it with you so that as a community we could attempt to define a better tagging and category structure for the site. Kroc pointed out that there was some inconsistency between the tagging schema I’ve used so far and we could do with better defining tags and categories. Kroc also had a suggestion that rather than use ratings we include a grade for the amount of html5 used in the site. Now I don’t profess to know everything about html5 what with it being such a mamouth spec but I’m sure with some help we could ‘review’ sites and give them a grading. What do you think of the current category structure? Do you have suggestions for how it should be better defined? What are your thoughts on the current tagging schema and how could this be better defined? Or should tags be removed altogether? 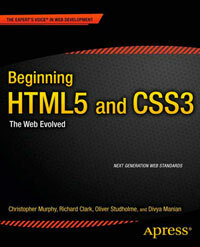 Should we include sites that only use html5’s doctype and no new elements, attributes or technologies? Should sites be graded on their use of html5? E.g. doctype only = 1 star, new elements, doctype, validates = 5 stars. If a grading system is implemented should we ditch the ratings system that currently exists and only allow admins to assign grades/ratings? I look forward to hearing your thoughts on the above and please feel free to join in the discussion, I’d like as many people to be involved as possible. Hey…not realy contributing an idea here but if i may would like to ask a question. I am a beginning web design student working on an assignment and your website was the first to catch my attention. Of course being new i looked at the source page using firefox and it just blew me away. A lot of advanced stuff that i haven’t even learned yet. My question is….did you use dreamweaver or some other web design tool to create this page?